Amena talks with romance fiction author Adriana Herrera. 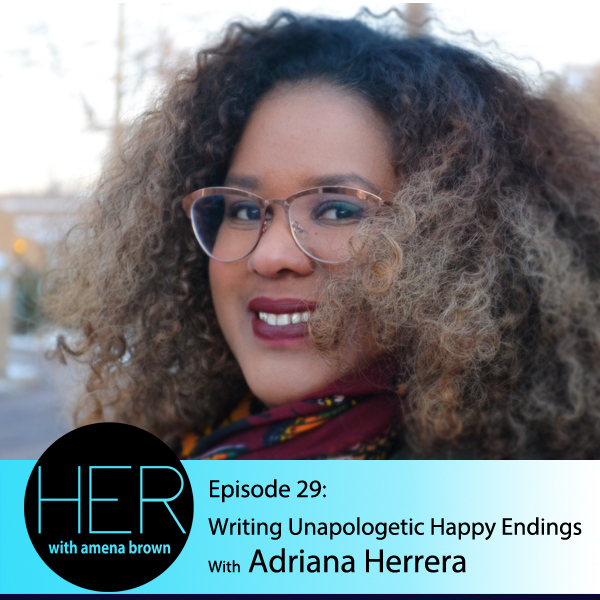 Author of American Dreamer and American Fairytale, a part of the Dreamer Series, Adriana talks about how her experiences in the field of social work inform her fiction and why she believes in writing unapologetic happy endings for characters of color. Amena and Adriana discuss how reading romance can be a form of self-care and how all of us can revel in our own happy endings/beginnings. To learn more about Adriana and to purchase her books visit: http://adrianaherreraromance.com. Adriana was born and raised in the Caribbean, but for the last 15 years has let her job (and her spouse) take her all over the world. She loves writing stories about people who look and sound like her people, getting unapologetic happy endings. When she’s not dreaming up love stories, planning logistically complex vacations with her family or hunting for discount Broadway tickets, she’s a social worker in New York City, working with survivors of domestic and sexual violence. Adriana has kindly offered to give away one copy of American Dreamer and American Fairytale to a lucky listener! This giveaway is open internationally and will end next Tuesday 4/23/19. Enter through Rafflecopter! Find Adriana on Instagram and Facebook!